Robin van Persie has travelled with the Arsenal squad to Barcelona. The forward was expected to be out until April at the earliest with a knee but trained with the first team squad this morning ahead of their Champions League show down with the Spanish champions tomorrow. It is unclear whether the Dutchman has travelled purely in a spectator capacity or whether he is fit enough to play. However the fact he was pictured training with his team mates does raise expectations he will be involved in some way. 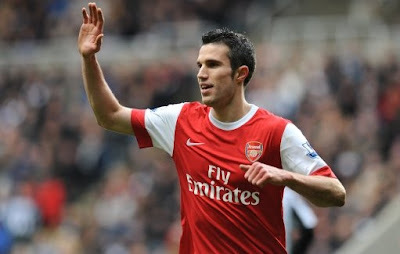 NOTE: The official site has now confirmed van Persie is part of the squad for tomorrow's game.